We welcome you and your children! Children stay in the sanctuary for the first part of the service. The Pastor shares “A Word for All God’s Children” after which the children wanting to attend Sunday school leave the sanctuary to go to their classes. Those children wishing to stay with their parents are welcome to do so. However, we do encourage parents to try to get their children involved with Sunday school, as it is a wonderful way for them to meet others their age in our church family. All Sunday School and Nursery staff are CORI checked and are dedicated to enriching children’s lives with the word of God through age-appropriate curriculum. Sunday School classes end at 11:15 a.m., at which time the children join the congregation following worship in the Norman Room for refreshments. (The Norman Room is the large space outside the back of the Sanctuary.) Sunday school goes from September into May. Special Events take place throughout the year for children and families, such as a hayride in the fall, our Advent Event (for making Christmas-themed decorations and snacks), and our Mardi Gras party, among others. Infant care is available during the entire service for ages newborn to Pre-K. The nursery is located on the lower level, and is staffed with a CORI checked adult assisted by a youth aide. Parents are allowed to stay in the nursery if they wish to help their child get settled. Our youth group, Pilgrim Fellowship, is for grades 6-12, and meets regularly. This group goes on trips, does fund raising, and engages in mission work. We have two adult leaders, Laurie Desjardins and Bonnie Blais, who oversee this very active group. The schedule is available in The Arrow (our church’s bi-weekly newsletter) or in the Sunday bulletin/Order of Worship. You can also call the church office (283-6958). There is a Confirmation Class that prepares youth in 8th and 9th grades for full church membership. It is held September through May every other year. Meeting times, responsibilities, and field trips are determined by Reverend Bruce, who leads this group. 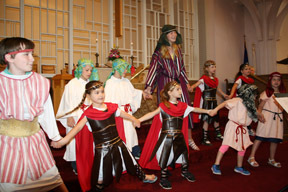 Our Christmas Pageant, presented each year, encourages participation from all the children as well as some of the adults. This is always a highlight of our Christmas season. 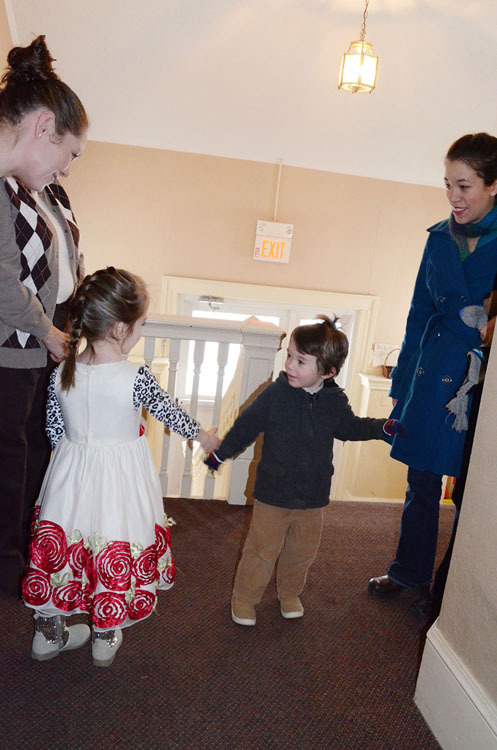 Children’s Sunday celebrates the end of the Sunday school year. 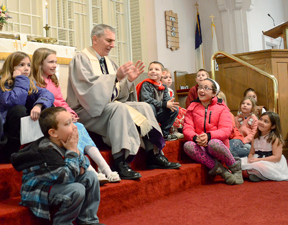 The children lead worship, act as lay readers, greeters, ushers, and do some singing. It is a time when we celebrate the youth of our church, the blessings they bring to us, and their growth in Christian faith through our Christian Education ministry. We hope you stop by on Sunday and let us enjoy meeting you and your family.